May has given way to June. With that shift begins a new summer of night fishing. just getting better the deeper we get into June. The waxing moon in the first part of the month is making casting easier and the takes visual. The number of strikes received in a night is climbing as the water warms and shallow water forage becomes more prevalent. I'm seeing more scampering mice both by headlamp along the river and in my headlights while driving. Frogs will be out soon. I'm beginning to see crayfish venturing along the margin of water and dry land. 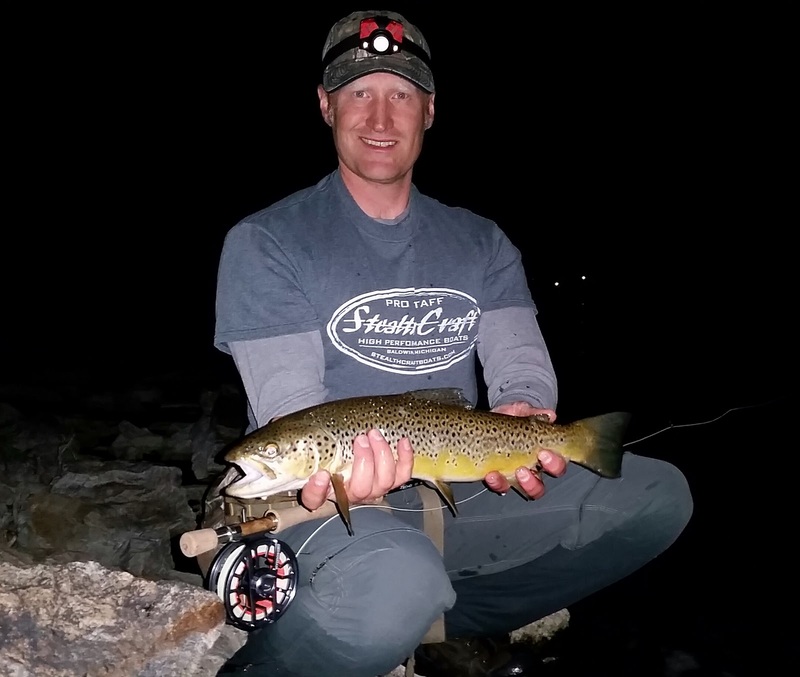 All in all, the reasons for a big trout to hunt the shallows in the dead of night are mounting up. To me, this is some of the best opportunity of the year to tangle with a trophy trout. 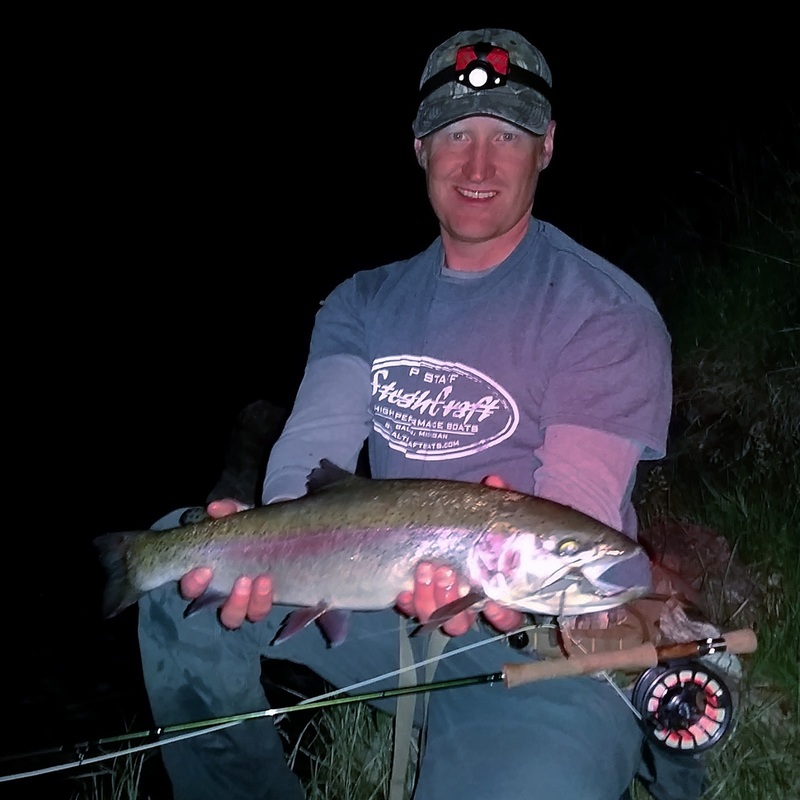 And what better way to do it than on topwater baits during the adventure of nighttime on a river void of other anglers. On the night of June 2nd and into the 3rd, I was accompanied by my friend Josh who has worked in the fly fishing industry but had never moused. The night was calm and partially moonlit. 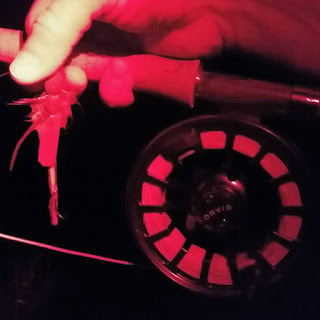 Once the sun was fully gone around 10:30 p.m. and darkness had set in, we dropped into the section of river I intended to fish and began some practice and instruction. Nothing major, just getting the general feel for what we'd be doing. Mousing to me is kind of like swinging streamers at short range. 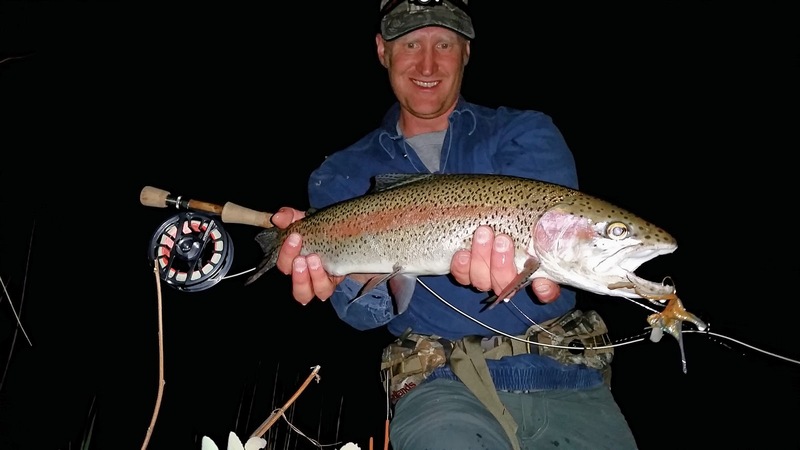 It's everything you're not supposed to do when dry fly fishing. Downstream casts. Drag. Tight line. Wake. Splashes. During our practice run Josh had two hits. He asked "Is this one of your special spots?" "Nope, this is a 'nothing' spot. Just meant to practice." That boded well for the night. A short distance downstream we came to the first piece of serious structure I wanted to target. We scrambled over some boulders and got into a decent casting position. Within a cast or two Josh fed his mouse to where the current wrapped around the point of a boulder just as I described. An audible slurp signaled a take and Josh set into solid fish. It didn't break top again in any of the usual ways. No rolling, splashing, or jumping. It just turned downstream and set Josh's reel to singing - and against a tight drag. He was through the fly line and into backing almost instantly. The fish blew through the next few points of structure I'd intended to focus on and went around a big jam - passing around the outside edge and then tucking in behind it downstream, still peeling line as it plowed into the next big pool. With Josh's permission I took his rod and darted off downstream over boulders and through the water. I worked out to the jam, freed the line, and reestablished direct connection with the fish. It had nearly spooled the reel. I regained a lot of backing onto the reel and worked my way back to the shoreline and down. We needed to chase, but we were free of the major obstacles now. Josh had been picking his way along the shore and intersected me where I slowed to meet him. I shouldn't have slowed, I should have stuck with my gut and kept up the pursuit. But I was glad to get the rod back into the right fisherman's hands. It was such an heavy fish. I hadn't had a fish run so far and hard on me since my steelhead days. I can't recall being that deep into backing. And this fish was still going. Josh remained connected for just a short time longer, and then it was off. Gone. I have to think that fish was exactly what I'm looking for when mousing. We were never in control, just trying to keep up and keep from getting spooled. It had to be a high caliber fish, probably at or approaching 30-inch class. It fought every bit like a 10lb fish or better. Last summer I caught one like that. It had made a similar run, but switched it up part way through and ran back upstream, affording me better opportunity to gain control and ultimately land it. Losing a trophy fish is part of the game. But that doesn't make it any easier. How long had it been since hooking up with a fish like that? How many more casts till the next? A loss like that is hard to stomach. It is the sort of fish that the majority of fisherman will never be lucky enough to battle with even once. I hope there's going to be another this summer. We pressed on. I fished more as Josh started doing his own thing. He never connected with another beyond the mometary tension in the initial hookset. I brought a couple rainbows and one brown to hand. 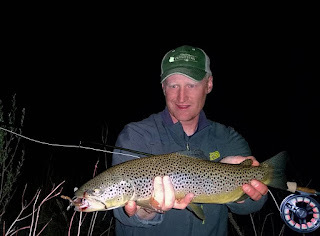 I had another brown in the two-foot range hooked and illuminated by headlamp - but it too came off prior to being able to net it. That was a really nice fish too - but it was nothing like the first one in terms of heft and fight. That first fish was seared into both our memories. Maybe, just maybe, he'll be back on that point another night. He wasn't there the following night - or at least wasn't going to be fooled again - but I missed good fish in other places that hadn't produced hits the night before. My mental catalog of brown trout ambush locations was expanded. It's hard to fish blind. But the payoff can be well worth it. Keep in mind that I have acquired federal land use permits to run mousing trips this summer on some prime water through Steinmetz Outfitters. If you've ever wanted to try mousing or would like your shot at hooking some big ones in the dark, give us a call! Click [HERE] for more info on mousing trips. I'll definitely be out there tomorrow night. Looking forward to fishing your patterns! Really, I should be the one traveling down YOUR way.